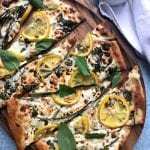 Charred Broccolini and Lemon Pizza - A perfect pie for spring! There are days when I feel like homemade is best, when the thought of waiting for dough to rise or stock to bubble is comforting and appealing. But just as often there are other types of days. Days when I repeatedly knock over my water glass and notice typos in emails to clients just after hitting send for instance. Or, like yesterday, days when I just can’t understand WHERE ALL THE ANTS ARE COMING FROM! So, I’m not about to reinvent the wheel here. What we need is something fast, cheap, delicious, and comforting when we’re in a pinch. Duh, pizza. 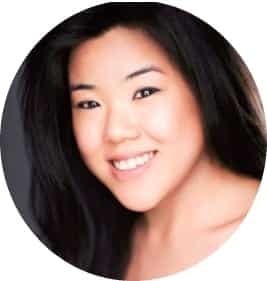 But perhaps a different spin on the ole girl, eh? Maybe throw some spring vegetables on there, even something unexpected like lemon. WHAT? 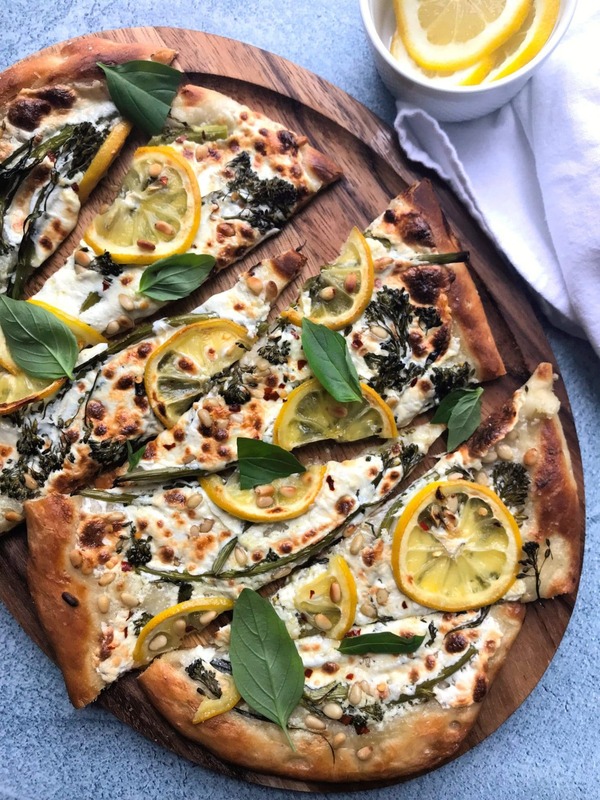 Lemon on a pizza? Too far, Madame…TOO. FAR. But hear me out, k? You probably already have a lemon rolling around somewhere, so that’s great. 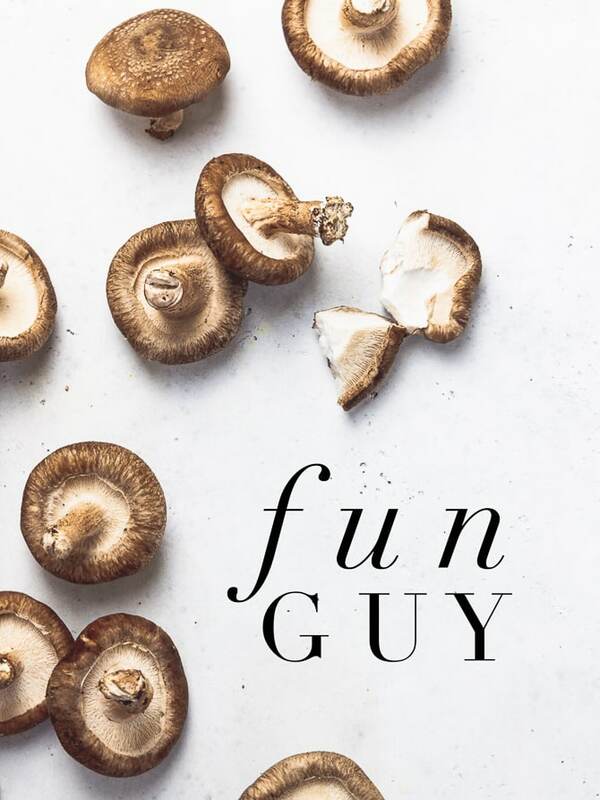 And when you thinly slice it and run it into a hot oven it will transform from abrasive and puckering to melty and jammy-delicious – kind of like you will when your face meets this melty cheese, charred veggie, tangy-sweet situation of a pizza pie. But here’s the killer tip, which honestly should be the main takeaway – YOU DON’T HAVE TO MAKE YOUR OWN PIZZA DOUGH. This is 2018 people. You can pop into most grocery stores and they will have pretty solid pizza dough at the ready for you. You can also go to your favorite pizza joint and just ask for a ball of dough or two. They will happily sell that stuff to you for a couple bucks. 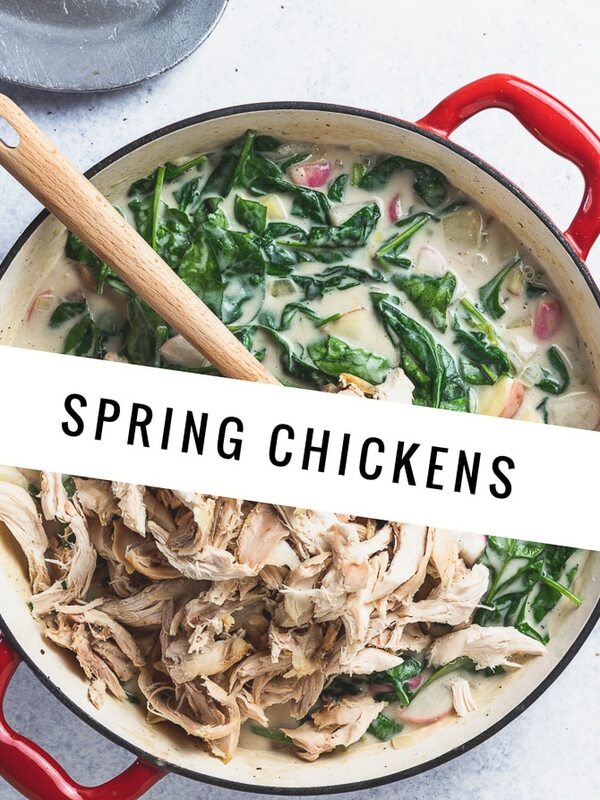 If you want to make it from scratch, by all means do – this recipe is my go to. 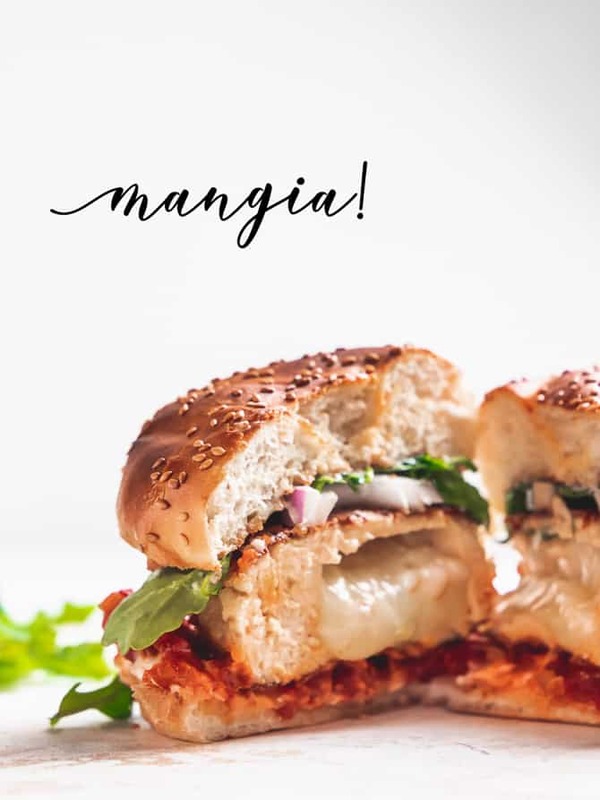 But for those days when “from scratch” is like saying “oh hey, let’s just go to the moon real quick” give store-bought a try – and if that’s still too much…ain’t no shame in that GrubHub game. A few things: 1. The broccolini can totally be substituted with plain, old broccoli here. But because broccoli is a bit beefier, I’d give it a head start by blanching for 2 minutes and draining well before putting it on the pizza. 2. Broccolini is prettier when left whole, but for ease of eating you may want to give it a rough chop. 3. You should probably buy an organic lemon for this, seeing as how you’re going to eat the skin and all. To be honest though I didn’t and we are not dead, but in the future I will. Preheat your oven to 475° F.
Stretch pizza dough onto a rimmed baking sheet that has been greased with non-stick spray. Combine 1 T olive oil with ricotta and spread over pizza dough, leaving a half inch rim. 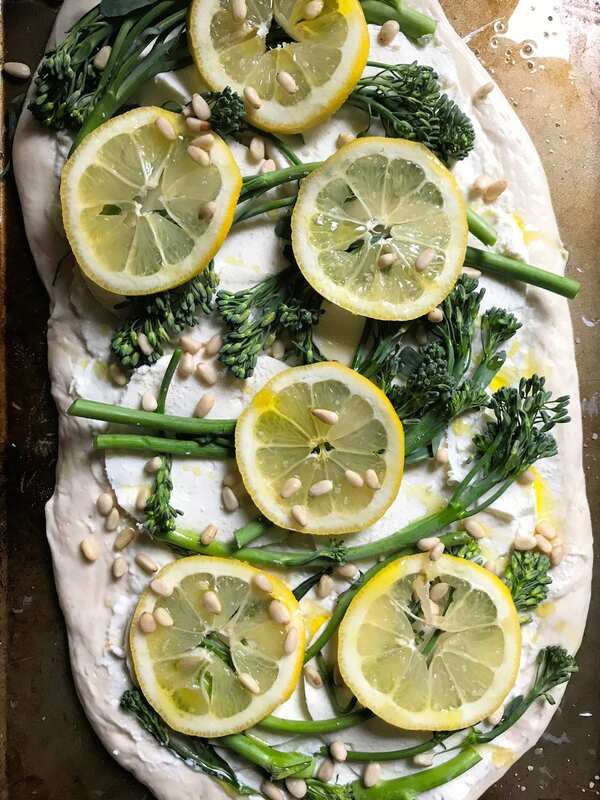 Layer on mozzarella, broccolini, and lemon slices. Sprinkle with kosher salt, chili flake, and pine nuts. Drizzle with remaining tablespoon of olive oil. Bake for 15-18 minutes, or until the underside of the crust is a light, golden brown. Remove pizza from oven and turn on your broiler. 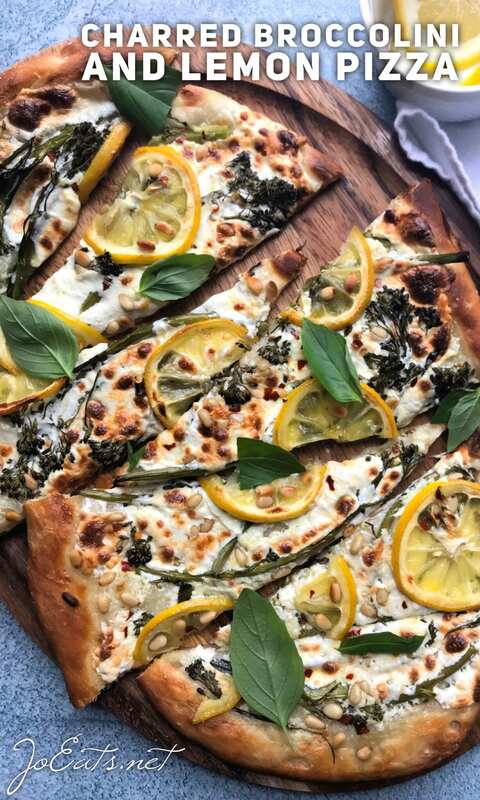 Broil pizza for 3-4 minutes or until the lemons pick up a little color. Do not walk away from this. It will be bad news. Remove from oven and let cool for five minutes. Garnish with fresh basil and serve. I do a broccoli and blue cheese pizza (with tomato-esque sauce base) and it is absolutely delish! Nice with some sundried or semidried toms. Loving the lemon idea!! I think it would work with potato topped pizzas too …. mmmm, potato, rosemary, sea salt and lemon slices …. I would so get down with a broccoli and bleu pizza! Lemon with potatoes and maybe some gruyere sounds delish as well. What an amazing idea! 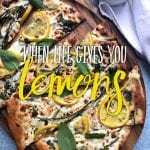 I have never had lemon on a pizza. I pinned this recipe (tailwind). Can’t wait to try it. I love how jammy and sweet the lemon gets. And it’s a great foil for the oozy cheese – of which there is an irresponsible amount if I have anything to do with it. I hope you enjoy! 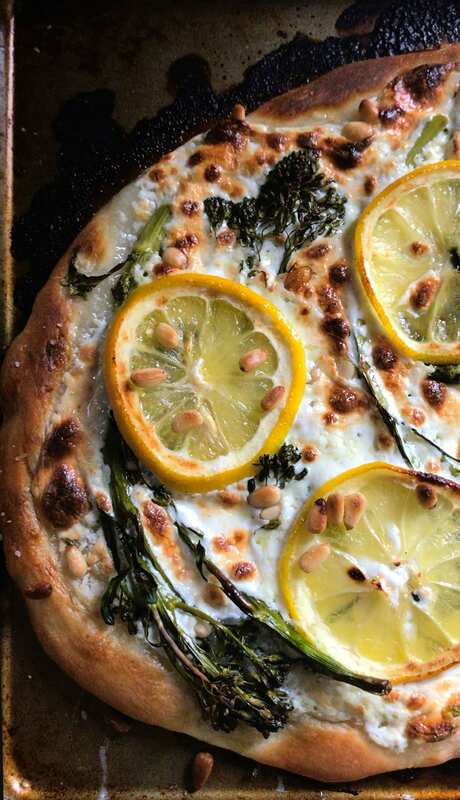 Looks so delicious.What a combination Broccolini+Lemon Pizza.I will surely try this at home. Thanks Andrew! It’s one of my faves.